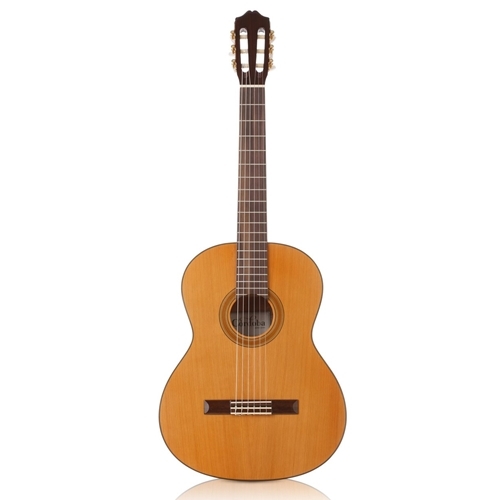 One of Córdoba's flagship models, the C5 is perfect as a first nylon-string guitar, this lightweight model is built with a solid Cedar top and mahogany back and sides to produce a clear, powerful tone with beautiful sustain. Handmade in the traditional Spanish style, the C5's carved headstock, hand-inlaid wood rosette, Pau Ferro binding, Savarez strings, and glossy PU finish result in a guitar that truly stands out from all other entry-level options. A lightweight adjustable truss rod is built into the neck for stability. Available in Natural finish with solid Engelmann Spruce top.